Throughout 2005, and with little fanfare, Richard D. James released the Analord series of twelve inches under the AFX moniker on his label Rephlex. In total, 41 tracks were released over a series of singles – Analord Volumes 1-11 – all neatly contained in a custom binder, sold direct to fans via the Rephlex website. Each record went on to sell into five-figure quantities – on vinyl format ONLY! The tracks were not available for download or on CD, making this a considerable sales achievement. For fans of Aphex Twin, it was an almost unprecedented bounty of new material in the gap since the 2001 double album, Drukqs, but many people who have abandoned their turntables will have remained unaware of this hive of activity. 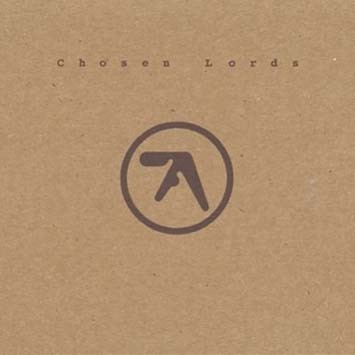 In April 2006, Rephlex will release Chosen Lords. 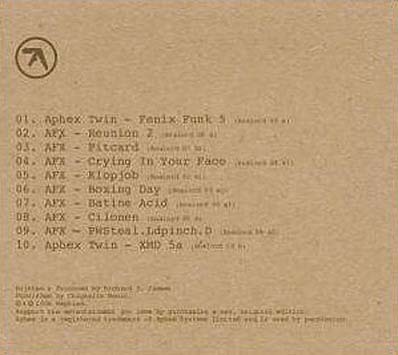 Rather than release a triple CD featuring all 41 tracks, AFX himself has distilled the tunes into a cohesive album, as it was intended to be heard. Chosen Lords is, in fact, the first full album of new material from Richard D. James since Drukqs, and the word of mouth is that the tracks are among his very best classics. The style? As with most Richard D. James releases, it's hard to pin down to any genre. Largely recorded on Richard's private collection of unique collection of analogue synthesizers – vintage, modern and home-made, the rhythms, melodies, harmonies, even some subliminal lyrics have all evolved directly from the machines. One could say Chosen Lords is partly-inspired by NY electro, Chicago house and Detroit techno classics, but the album also stimulates the kind of ‘lucid dreaming’ atmosphere found on Selected Ambient Works 85-92. Many people try to imitate Richard's sound, but he remains an unrivalled innovator when it comes to the emotional and musical depth and complexity of his tracks. As this composer and producer's skills and life experiences are constantly evolving, so too does the music gain ever greater resonance. If you are interested in looking back to past memories, through your current mood or forward to future emotions, you're going to find something of interest on Chosen Lords. The only limits are self-imposed. Since 2001, the only Aphex Twin/AFX related releases have largely been reissues: the 26 Mixes For Cash double CD (Warp, 2003), Hangable Autobulb CD (Warp, 2005) bringing together two EPs on CD for the first time, two 12"s on the Men imprint (remixes of 808 State, DJ Pierre and The Bug), 'Mangle' on the last Rephlexions compilation (Rephlex, 2004), and a limited edition split 12" with LFO (Warp, 2005). Chosen Lords is Richard D. James at the peak of his powers, in the prime of life. Unmissable.